Named after the Greek Mathematician. This classic method of finding prime numbers is also great for teaching about factors and multiples. 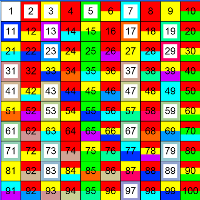 The visnos sieve allows for multi colored squares this allows identification of any numbers prime factors.